What Is A Rear-View Camera In a Car? What Do You Mean By A Rear Camera? How Does A Car Rear View Mirror Work? What Is An Auto-Dimming Rear View Mirror? How Much Does A Rear-View Camera Cost? Can You Add A RearView Camera To Your Car? How Do You Install A Wireless Rear View Camera? How Do You Install A Rear View Mirror? The best rear view camera is a compact and powerful tool that help you safely park your car in a tight parking spot. How many times have you nearly killed your pet or damaged the rear of your car while reversing? I’ve lost the count of mine. Once I found and installed one of the best rear view cameras on my RV, I never had to look back (see what I did there?). The very fact that these cameras will be mandatory in all cars by 2018 in the States speaks volume of its effectiveness. You don’t need to have sound engineering skills to hard wire the best rear view camera in your vehicle. And the most amazing part is they don’t cost a fortune. If you are struggling to choose the right product from hundreds of options, count on me. Below I have reviewed the 10 best currently doing the rounds of the market in order to help you find your best rear view camera. 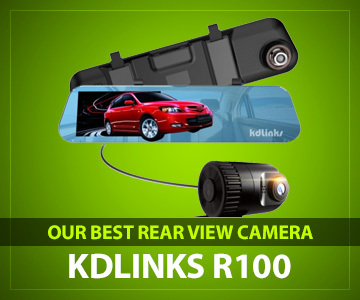 The KDLINKS R100 loaded with features worth checking out. It has an excellent night-vision which most cameras in its range lack miserably. It can be used in both single camera mode and front-and-rear mode. It records the footage of the road ahead, oncoming traffic and also lets you view the recording from both cameras simultaneously. It amplifies your security while driving by minimizing the rear-on and head-on collision. Moreover, if you accidentally damage any property while driving, you can show the actual footage of the crash as an evidence to the cops and save yourself from being arrested. If you are like me who spend the majority of their lifetime on the wheels, it’s extremely important to install a gadget like this strictly for security purpose. The rear-view camera fits in a snap. You will just have to strap it over the rear-view mirror of your car. I was quite delighted to notice that the actual mirror view is visible from the edges of the screen. So, basically, you can use both the actual mirror and the rear-view camera at the same time. The HD monitor is a class of its own. It’s slightly tinted to prevent glare, thank god for that. With the help of the cable that comes with the product, you can position the rear-facing camera on the rear-window. This is the ideal position for installing a camera while parking. I have no idea why most dual lens cameras allow the rear-facing cameras to only be set on the license plate. The 140-degree wide angle lens documents the footages at 30 frames per second. While driving, if your car comes precariously close to an object, the G-sensor stops the current video playback and starts showing the moments leading up to a probable crash. The biggest advantage of this camera is that it can be installed in a position which provides the best rear view. The accident-detection and loop recording of the device ensure unmatched security while driving and parking. As far as the video quality is concerned, I cannot complain. I personally did not encounter any major issue while testing the product. 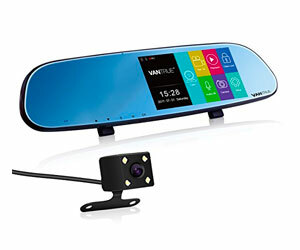 Vantrue Dash Cam is an easy-fit rearview camera. All you need to do is strap it onto your car’s existing mirror and that’s it. Due to this reason, it doesn’t gain as much attention while parking as cameras wired in the middle of the front windshield. The unit has a premium look and feel and comes with two sets of straps. You can choose the one that goes best with the thickness of your vehicle’s rear-view mirror. To make the installation further easy, the package includes a wrench as well. For those who don’t know, a wrench is an S-shaped plastic tool. It made hiding the cables a breeze for me. While the front camera has an excellent resolution and crisp picture quality, sadly, I can’t say the same for the rear camera. The picture quality could improve, especially when I compare it to the crystal clear footages of the front camera. One of the coolest features of this unit is that both cameras function simultaneously. You can watch footages from both cameras on a single screen. Alternatively, using the picture-in-picture mode, you can enlarge footage of one camera on the screen while the feed from the other camera will be minimized to a small window. In order to adjust the viewing angle, you will just have to adjust the front camera instead of the entire mirror. Cool, isn’t it? While the image quality is jaw-dropping in the daylight for most rear-view cameras, we can’t say the same about the night-vision. Powered by NOVATEK NT96655 processor along with an upscale low light image sensor, the Vantrue N3 provides images with excellent clarity and color output even at night. Although the 170-degree wide angle lens has a decent coverage, I’d have preferred a wide angle lens for a better coverage of the traffic behind the car. To prevent those unsightly back-over accidents and aid smooth parking, the system automatically activates parking guidelines when you shift your vehicle into the reverse mode. Whenever a possible collision is detected by the G-sensor, the entire footage will be recorded and saved to the MicroSD card. This file cannot be overwritten. The file name will have SOS in the beginning. This way, you can find the correct footage in seconds. The mirror has a light tint to prevent glare. Moreover, with simple hand gestures, I could activate the 5” IPS panel. I just had to wave my hand to start or stop recording. The ride was fun this way. The Vantrue N3 is packed with the quite a great number of up-to-date features. From easy installation to infallible protection against collision, it scores high in every department. To aid uninterrupted driving, it lets you control the touchscreen with a simple hand wave. If that doesn’t sound like perfection, what will? I bought this camera for my Chevrolet Cruze. It is the updated version of AUTO-VOX’s popular M3 series. The updated version of M6 I got has the rear-view recording function. A unique thing about its design is that you can’t even tell if it’s there at the first glance. You get an elastic strap in the package which lets you mount the camera on the rear-view mirror. It fitted neatly on my car’s rear-view mirror without blocking the actual mirror-view which is pretty cool. Mind you that the screen isn’t tinted. Therefore, you have to deal with a slight glare while driving under scorching daylight. Coming to the picture clarity, the view of the primary camera is top-notch, both in daylight and at night. The wide-angle lens used here gives a pretty decent coverage. However, on the downside, I did struggle a bit to cover up the wires. It would have been better if we could connect it directly to the fuse. The LCD touchscreen is bright, sleek and the OS is highly responsive. There are lots of buttons on the screen. If you are not a techie, you might need a while to remember which button does what. The motion detector integrated into the cam will start recording automatically if an object is within 3 cm. For parking assistance, you have to engage the R gear and the device will automatically display the parking image. Last but not the least, with the latest firmware update, you can enable the recording feature of the rear-view backup camera. All in all, the AUTO-VOX M6 is everything an up-to-date rear view camera should be. It has the latest features coupled with a great user interface. If you are a patrolling officer, cab driver or simply a common man who drives a lot, this could be a great investment to provide additional road safety. Be it a Chevy, Hyundai, SUV or a Fleetwood, this backup camera is compatible with almost every popular car models sold in the states. You will get a default bracket with the product which goes with the original windshield bracket of most cars. Therefore, you won’t struggle while mounting it on your car’s windshield. The size of the camera is larger than the previous one I owned but that’s no big deal. Covering up the video wire that goes right over the headliner is quite easy, thanks to the wire cover it comes with. An Allen wrench is also included in the package for the ease of installation. It took me about one and a half hour to get this bad boy installed properly. How much time and effort you’ll need depends on your car model and how you wish to install it. The low-light sensitivity of the backup camera is on par with those of the more expensive cameras. You can detect the objects like pole, bumper or wall. In order to get a full view of the vehicle, the camera should be ideally placed near the roof. The license plate camera is wired on a thin metal arm. You could easily rotate it in a direction you want to get the desired angle of view. To sum up, I am very happy with the way the camera has performed for 3 weeks. Yes, the installation wasn’t a cakewalk but it wasn’t a big deal either. With the Allen wrench, I could easily tighten the set screws against my car’s windshield mount. The video has nominal noise during the night and an exceptional clarity in daylight. If you are a die-hard tech-enthusiast, this bad boy is definitely worth checking out. To begin with, both the front and the rear-facing camera are a class of its own. In most dash cams, the footage quality of the rear camera is iffy. But I can safely say that junsun has ensured that you can view the objects with optimal clarity even under poorly lit circumstances. It took me roughly 50 minutes to finish the wiring and installation from the moment I unboxed the equipment. With a little hard work, you can easily conceal the wires. Just once one mishap occurred. I plugged into the cigarette lighter and the monitor kept turning off and on its own for some time. Then I plugged into the 12V charger and the issue disappeared. The cable length should be adequate for most car models and motorhomes. The Bluetooth functions well for handling phone calls but I had a tough time adjusting the volume with it. The DVR uses Android 5.1 Lollipop, therefore, you can use your preferred media player on it. The image clarity and color contrast of the 7” screen make it totally worth the money. However, due to the low screen resolution, if you play 720P or 1080P videos, it will be downscaled to 480P. The stock GPS works just about fine. Nothing extraordinary about that. This is definitely one of the better dashcams I have tested in this price range. Most other products with such premium features are pretty heavy on the pocket. I won’t say all the features work as smoothly as advertised. But for what it is worth, having an Android device built in a dash cam makes your boring, hectic drives enjoyable, especially if you have kids or friends with you. The AUTO-VOX M3 is the predecessor of the VOX M6. It fits snugly on my car’s rear-view mirror without entirely blocking the rearview mirror. It kind of looks like the camera is a part of the mirror itself. The wire length is enough to run all the way to the back of my car. I would suggest you figure out where you want to place your back camera before purchasing it. One of the key features of the dash cam is the four view options with a 170-degree ultra wide angle lens. You can get a fairly stretched view of the objects and the PIP feature lets you see footages from both cameras on the LCD screen simultaneously. The camera will turn on automatically when you start the car and shut off when the engine stops. You need not press any button for that. I pushed a 32 GB memory card in rear the mirror. To make sure that the recording doesn’t stop when the memory is full, I always keep the Loop Recording mode on. One thing I discovered recently is that the size of the front camera is bigger than the rear-view mirrors of most cars. That could be an issue for some, especially at night. The back camera has 6 LED nights accompanied by WDR and Sony sensor to minimize the noise and produce sharper images under dimly lit conditions. 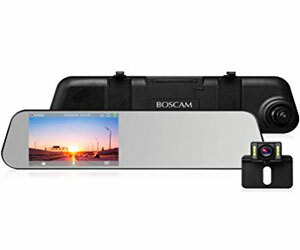 Having a handy dash cam like this installed in your car can save you from false accusations and legal troubles in the event of an unfortunate accident. To my utmost delight, it records videos in real-time and date. Therefore, you can use the recorded footage of the accident to the insurance company and cops if you ever find yourself being accused in a hit and run case. In terms of design and installation, there’s hardly any room for complaint except the screen glare. This dash cam is best suited for people who drive in harsh weather conditions through unforgiving terrains. For, it uses an IP 6G weatherproof rear-view camera which can seamlessly operate at extremely high temperatures. 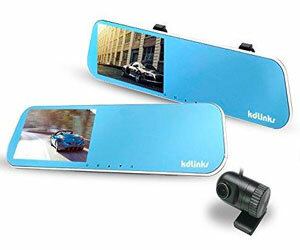 The primary camera provides a stretched view of the road with its 150-degree wide angle lens. Both cameras can record simultaneously and you can see the footage files from both cameras separated after switching on the playback mode. When you reverse your car, the screen automatically starts displaying the rear-camera view. The powerful G-sensor activates whenever an imminent threat is detected. While there’s a Picture in Picture mode that displays the view from both cameras on the screen at once, you can manually switch between front and back camera too. Another feature I absolutely love is the IPS touchscreen. The Menu icon of most of the dash cam monitors I have used is annoyingly small. But fortunately, not in this one. The icons and control buttons are large and therefore, easily identifiable. The device comes with two straps. I just randomly picked one and snapped the front-facing camera on the rear-view mirror and that was it. It came with a 19.69 feet cable for the back camera. I could easily run it through the headboard, all the way to the left side door. This is by far one of the easiest to setup dash cams I have ever chanced upon. It’s nearly a plug and play device. The sleek design fits neatly on the stock mirror, almost gelling with it. The 7” IPS display is super responsive to touch and endowed with a nearly flawless UI. Clarity of the image is the first thing to take into account while purchasing a backup camera. Even if it’s not a traditional camcorder-level clarity, you should at least be able to clearly see the moving objects and creatures near your car. This is more so important for the footages that show the moments leading up to an accident. The isYoung 720P rear-view camera has set the bar high for its competitors. Even when you are driving at high speed at night, there is a minimal distortion in the feed. The G-sensor activates whenever it detects G-force impact and locks the footage of the accident for safekeeping. You can even take still pictures by simply pressing the Mode button. The parking monitoring ensures that you don’t unwittingly hit a pole or wall while parking in a tight spot. It actually works as good as it sounds. It has saved my Chevy from almost smashing against a wall about two weeks ago. So, I can vouch for it. When you shift into the reverse gear, the screen would automatically turn on recording from the back camera. The only major downside of the equipment is that I couldn’t find the Loop recording option. The description says that it supports loop recording for 5 minutes. I don’t think it is a device-specific issue. Despite one glaring flaw, the device is a good bargain for the money. The installation was quick and streamlined. There was no exposed wire in my car after installation. The blue tinted mirror prevents glaring when you are driving in sunlight. So, if you could get past that one glitch, it is quite a decent product for its price. Unmatched video quality, simple installation paired with practical features- the next product on my list combines all of these. For maximum security, the G-sensor is activated by G-force events. In simple terms, whenever you car accidentally hits an object, it records it, marks the file and makes sure it is not deleted from the memory while loop recording. On top of that, it captures real-time videos. Therefore, whenever you get into any hit and run scenario, you can use the recorded footage of the accident to avoid any legal mess. The 150-degree wide angle lens provides a stretched view of the road traffic and moving creatures on both sides of the road. I like to use a timer so that the camera turns off on its own if I forget to do so manually. Another plus is the one-button design. It saves the hassle of remembering the right buttons for individual functions. Press the button to change view modes, turn the PIP function or toggle between front and back camera. The cable length for the rear cam is 18 feet. I could route it without any issue by following the manual between the lines. The front camera sticks firmly on my car mirror. Considering the price, I daresay that the video quality exceeded my expectations. You can clearly see the road events on the screen without having to constantly adjust the angle. If you follow the manual properly, the wire work should roughly take 40 minutes. Perhaps the most challenging part of the setup is to cover the wires. In case of any assistance, call the customer care. The guys on the line are extremely polite and seemingly knowledgeable too. The very first thing about the product that grabs your attention is the suave design. The front camera sticks to the left side of the mirror. This way, I can use both the camera and the actual mirror at the same time, something you would really appreciate if you have passengers at the back seat. I was able to easily run the table through the headliner, all the way to the rear passenger door. The effort to mount the front camera was next to nothing. There was one negative in an otherwise great equipment- the battery. I didn’t understand why the manufacturer claims it to be battery powered. If I keep my car’s engine shut off for more than 30 seconds, the camera will turn off. The light reflection of the tinted screen also bothered me to some extent while driving in daylight. Other than these, I didn’t notice any other glaring flaw in the design or functionality. The Picture-in-Picture mode would let me view the feed from both cameras on the screen. The parking mode is a real savior. It activates the rear view cam and shows the full view of the parking spot to prevent any collision. On top of it, it offers GPS navigation as well which works just as good as it should be. Both the front and back camera have quite a decent image output compared to the not-so-hefty price tag on it. You don’t need to have a technical know-how to set this unit. The 6 layer glass ensures there’s no blind spot in the videos, a very common issue of budget dash cams. For the memory card, I would strongly recommend you to opt for Class 10 memory card. Every car has a rear-view mirror that lets you see the oncoming traffic behind your car as well as the passengers in your backseat while driving. These mirrors can be manually tilted depending on the amount of the light in the environment. The mirror is placed on the top of the windshield and can be easily adjusted to get the desired viewing angle. Nowadays, most cars have anti-glare protection the rear-view mirror to reduce the glare of light which can otherwise hurt your eyes. These mirrors are on flat. Instead, these are wedge-shaped mirror with a thicker upper edge. A rear-view camera can help you safely park your car, eliminating the chances of collisions with a wall or a living creature. When you shift your car into the reverse gear, the rear-view camera activates automatically. You can see the parking view either on the left side of the rear-view mirror or on the LCD screen if your camera comes with one. The parking guidelines will help you to park your car in line with other cars parallel or perpendicular to the curb. It will also show, through different symbols, the closest and the farthest objects from the vehicle. Rear-view mirrors have a tab that allows you to adjust the position of the mirror. When you drive, the light from the headlights of the vehicles behind you reflects on your car’s rear view mirror. You can be blinded by that light and your reflex will be to cover up your eyes with a hand. Imagine trying to do that while driving! A rear-view mirror has a reflective back which is made from a thin metal while the front is a wedge-shaped surface of the glass. The front glass surface significantly reduces the amount of light that’s reflected into the driver’s eyes. At night, you simply flip the tab to change the position of the mirror. That way, the shiny, reflective surface will face the dark ceiling of the car. Only the low-reflection wedge will show the view from the rear-window. Thus, you will be able to see a dim image of the headlights. Auto-dimming mirrors came into existence in 1949. A brainchild of Jacob Rabinow, these wedge-shaped rear-view mirrors has an interesting way of working. Ever heard of the Troxler effect? No worries. I won’t go into the nerdy details. In a nutshell, if you stare at a red circle placed in at the center of a blue circle for long enough, the circle starts to fade away after a certain time. This is relevant to the context as our sight is affected is the same manner when we drive at night with bright headlines. This can reduce the driver’s response time by up to 1.4 seconds. The auto-dimming rear-view mirrors reduce this effect with the help of ambient light sensors. These sensors have microprocessors that can detect the glare resulted from the headlights of the trailing cars. The electrochromic gel residing between the two layers of the glass dims the light reflected from the headlights of the trailing vehicles. And as a result, you can drive safely at night without the risk of headlight glare distorting your vision. Rear-view cameras are going to be mandatory for cars from 2018. So, the clock is ticking and you must hurry and learn as much as you can about backup cameras before buying one. I totally understand that you’re probably wondering how much these tiny but life-saving gadgets might cost. It could cost anywhere between $25 to $800 depending on the brand, model, and features. While $25 products would be a brutal compromise with the quality, I don’t find shelling out 800 bucks on a rear-view camera logical. After dealing with automobiles for living for almost 25 years, I’ve found that devices in the $150-$200 range are good enough to provide added security while driving and parking. Adding a backup camera to your car is actually not as complicated as most people think. If DIY isn’t your thing, you can always call a mechanic to do the job. Note that different car models and cameras types require different setups. Backup cameras are generally installed on the license plate in order to get a clear view of the parking spot as well as trailing cars. Figure out where you exactly what to place the camera, on the bumper or license plate. Also, plan how you are going to route the cable from the headliner, all the way to the back of the car. In order to mount the rear-facing camera, drill a hole on the license plate or bumper, position it at the center. I usually route the wires along the headliner and the passenger door. Stretch the cable through the rubber grommet and if possible, connect it to the camera from the back of the bumper. Connect the camera to the accessory outlet and LCD monitor to the windshield. For the power supply, plug the cord into the cigarette lighter. In order to connect the monitor and camera to the car’s display screen, you can route the cable into the dash near the A-pillar from under the kick panel. The last step is to mount the viewing screen on the rear-view mirror of the vehicle. If you have a dual dash camera, the front-facing camera has to be mounted on the mirror with the help of a strap. For more detailed and product-specific instructions on wire-feeding, refer to the manual provided by the product manufacturer. Remove the mounting button attached to the mirror. In order to activate the glue, it’s crucial to make the windshield warm. You can use a hair dryer to warm it up. Also, wipe the windshield and mounting button with alcohol or a glass cleaner. If you car model is new, it should have a black band to indicate the accurate position for mounting the mirror. But even if it doesn’t, you can figure out from the outside of the windshield where you exactly want the mirror, ideally 4 inches down from the headliner, right at the middle of the top of the window. Once done, spray activator on the inside of the windshield and backside of the mounting bracket to aid faster adhesive curing. Apply adhesive on the bracket and stick it on to the windshield. Push it firmly for about a minute so that it sticks properly. Use an Allen wrench to separate the mirror from the baseplate. The thumb rule is to first glue the baseplate to the windshield. Wait for at least 15 minutes before attaching the mirror on the baseplate. Tighten the lock screw to secure mirror on the baseplate. Although it’s difficult to narrow the options down to just two, KDLINKS R100 Ultra is, by all means, the best rear-view camera on my list. The installation time was exceptionally short and the view front both cameras, even at night were quite sharp. The overall performance makes it a stellar bargain for the money. However, the AUTO-VOX M6 looks almost equally promising to me. That’s all for today. Hope you find the best rear view camera that perfectly fits the bill right within your budget soon enough.